Gerry Blake kindly sent me the following three pictures. The photograph shows the original line up of The Avengers. Left to Right: Greg Likins, Gary Bernard, Ken Zigoures, Gerry Blake, Henry Gonzales and Jim Robesky. Here's what Gerry had to say about this pic. "As you can see, I was not playing keyboards yet. My right arm was in a cast. Jim Robesky is playing the Farfisa and is hidden behind Henry Gonzales. Ken Zigoures was no Jack Bruce, but man, could that guy dance. He had some great moves. but often, he would concentrate more on how he looked than what he was playing. Consequently, he made mistakes. I honestly can't remember the moment this pic was taken but if you look at Henry, he seems to be glaring to his right and Ken seems to be peeking back at him. I'm sure Henry is giving him 'that look'"
Over the course of a few months I've been corresponding with Gerry Blake from the awesome 60s garage band The Avengers. He saw my review of their 45 'It's Hard To Hide' / 'Open Your Eyes' on my blog and thankfully got in touch. 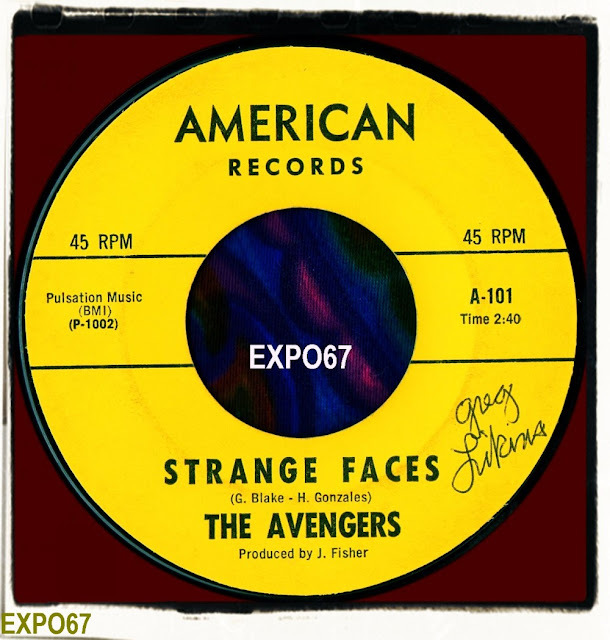 I managed to coax some really excellent information out of Gerry and hope fellow garage fans around the world will also dig his interview and the stories behind The Avengers!!! Can you confirm where The Avengers originated from. some sources state San Bernardino others state Bakersfield, California? The Avengers were all from Bakersfield, California, Kern County, USA. Not sure where the San Bernardino rumor came from. How did you all get together to form a band. Where you all school friends? What was the original line-up? I really wanted to do this! So I went home and told my Mom I needed a guitar and amp. She took me down to a pawn shop and bought me a St. George guitar and to Sears and a Silvertone amp! 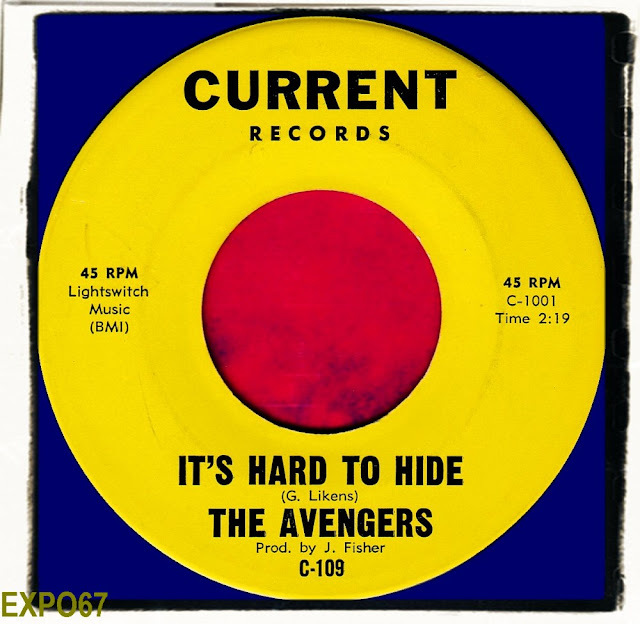 2 weeks later I played my first gig with The Avengers at East Bakersfield High School with my guitar turned down because I really couldn't play! 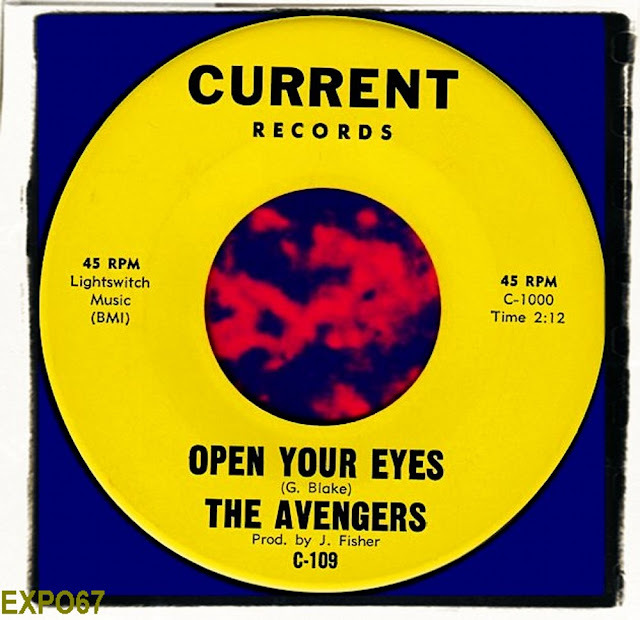 The Avengers released 5 singles on various labels. Which of these 45s did you play on? I played on all of them. Allow me to digress: By the time we were doing the 45's, Jim Robesky (sax, organ) had left the group. But the organ had become an integral part of the sound. Count the guitars including the bass. Jim had begun missing gigs so he showed me a couple of chords, etc, so I could at least play the important beginnings or endings of songs. When he departed, he left the organ. I was low man on the guitar pole. I didn't like it at first. I wanted to be a guitar player. But I was happy it happened later! So now, I was practicing day and night to learn the ORGAN! Thankfully, they didn't force me to play the saxophone. I would have QUIT! 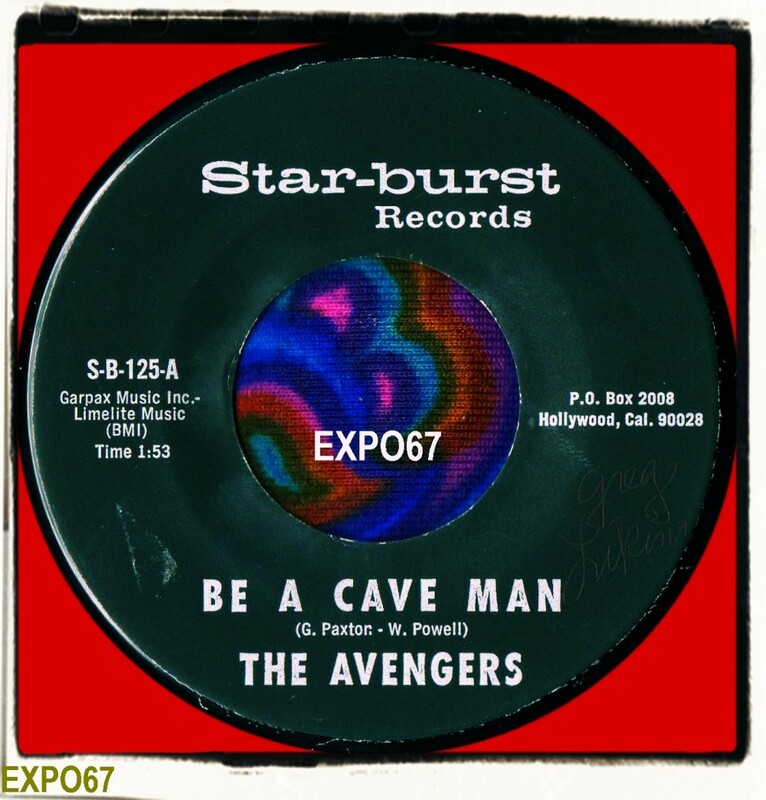 The very first Avengers song I heard was 'Be A Caveman' from the mid 80s comp 'Get Primitive - The Best Of Pebbles - Volume 1'. This came out in England on Ubik. I thought the song was pretty damned great especially the lyrics and the ultra cool guitar break. It's very politically incorrect...ha ha ha. I'm not sure we even thought about how politically incorrect Caveman was. We just liked the song. It would get people dancing for sure. I don't think the girls thought much about it either. It was a different time back then. It was just music. We weren't dragging any girls behind the stage by the hair. Although some of them might have gone for it! By the way, the "monkey" sounds was one of us trying to make monkey sounds. Didn't cut it. So Gary Paxton just looped it and sped the recording up. I was the Tarzan yell. Where did The Avengers play gigs. Can you remember the names of the Clubs and venues? Did The Avengers play any gigs with other bands on the same bill. If so who were they? We were too young to play clubs. We played a lot of school dances, as a matter of fact, became the #1 pick, if I may say so, among the kids. School dances were BIG back then. Except for he time we were playing the Stones, "Off The Hook" and I transposed the words to "On The Rag". The adults were none too happy and we came close to being "banned" from ever playing the school district again. I honestly believe it was our popularity that overcame that incident. Camera light bulbs flashed over and over. They wouldn't stop screaming. Afterward, I thought, "Yes, YES, this is what I want to DO!! And the rest is garage band history..
We also opened for Ike and Tina Turner, The Mamas and the Papas, Eric Burdon and the Animals, War, and more. It was a great time. For me personally, The Beatles were the #1 influence. But there were many others. Most Brit bands, of course the Stones, Yardbirds, Chad & Jeremy, etc. Paul Revere and the Raiders and a lot of U.S. one or two record groups, The Music Machine (Talk, Talk) who we opened a show for. Jimi Hendrix, (Although we never played any. No guitar player would attempt it. Well, there was one, and I jammed with him but we never worked together.) But there were many influences on me personally that stay with me to this day. You mentioned that you did not write 'Open Your Eyes' (although you are given the writer credit on the label). Henry Gonzales wrote the song. How did he feel about the Record Company error? Did it cause any friction? I can't remember even discussing it but I know how I would have felt so I'm sure he was disappointed, to say the least. Can't say as it caused friction between us and if it did it was soon forgotten. Did any of the 45s become successful. Did they get any radio plays? I would not say any of the records were successful. Locally, because of our DJ connections and friendship with the top radio station in our area, we got a lot of airplay. Even at that, the highest on the local chart a record got was #13 I believe. We never saw any money for the records. We played a club in Los Angeles (It was an afternoon gig). On the bill with us was a group called Sky Saxon and the Celtics (They went on to have a big hit with 'Pushin' Too Hard' under the moniker of The Seeds of course) who were a little older than us and thought WE were great (We thought they were outstanding). They had long hair of which we were highly jealous of. Anyway, although at the time we didn't understand it (Remember, we were a bunch of 16-17 yr old kids). Looking back it was a "showcase" for some people who were there. One of which was Bob Hudson a DJ with KRLA radio in Los Angeles. KRLA was THE biggest station in LA. After our set, we went over to meet Hudson and he told us he really liked our sound and was going to PLAY OUR RECORD ON THE STATION AND HELP PUSH IT AND WE WOULD PROBABLY REALLY MAKE IT! We were flabbergasted. On our way out of LA we actually HEARD 'When It's Over' being played on the air. We thought we had arrived! Two weeks later, Bob Hudson was killed in an auto accident. As far as I know the record was never played on the station again. Bad luck! Tell me about the production and the studio(s) used for recording The Avengers. Did you have enough studio time to get the records to sound as good as you wanted them to? What instruments did you all use? 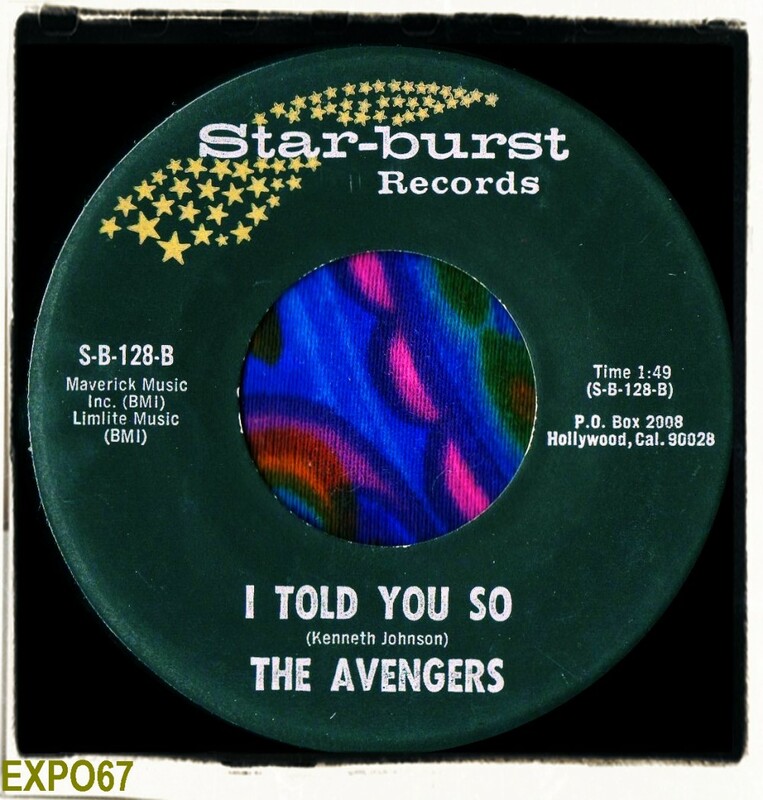 I know from an earlier email that Gary Paxton produced all of The Avengers records. Was the band happy with his work? Gary Paxton was/is a genius. He had an incredible ear. He could hear things, mistakes in recordings that we couldn't. He was a wonderful arranger and this I watched very closely and I don't mind saying that I went on to be known as a pretty good arranger of songs in my own right. But he had the knack! We recorded mostly in his house in Los Angeles. This guy was ALL music so what would have been his living room was the studio where we would set up. Directly upstairs in what would have been a bedroom was the control booth. We would go over and over and over a track until Gary (using an intercom) would tell us, "Ok, come and listen.." We were always so glad when we heard that. He would make us do something until HE liked it. Which could be HOURS! He was a perfectionist. But I must say working with a bunch of kids who'd only been playing a couple of years must have been tough for him. Things certainly weren't perfect. But we got it done. We were always happy with his work. Some of the things he wanted us to do, instrumentally and vocally, we thought was kind of "cheesy" and dumb. It wasn't until much later did I understand why and realize what he was trying to do (find a "hook" or make a "novelty" song, of which he was known: Alley Oop/Monster Mash) and how right he was. Originally, all the instruments were pretty much all Fender guitars and amps. Gretsch drums, I believe. We opened the show for The Animals. Just prior to our performance, the equipment manager approached Kenny our bass player and asked if we would be interested in THE ANIMALS ORGAN! We thought WOW! A VOX CONTINENTAL! COOL! He went back to him and asked how much? He said $300. Well, none of us had $300 so we asked our manager and he said NO, NO, NO. I'm not buying an organ. We were highly disappointed. We thought maybe we could appeal to his giving side so Kenny went back and asked him (in so many words) what would happen if it just disappeared? He said, with a sly grin, No problem. I just report it as stolen and get a new one. We figured that was an open invitation to help ourselves. So after our set as we rolled our gear out we rolled the Vox out too! At the end of the concert a great commotion went up: SOMEONE HAS STOLEN THE ANIMALS ORGAN! Police were advised, our manager INSISTED they check our vehicles to SEE that it wasn't us. Fortunately, it had been taken to a secure spot. 1. The guy KNEW it was us. He COULD have said so except that HE had tried to sell it to us. Illegally, for sure, since it wasn't actually HIS! 2. The Vox Continental Organ NEVER WORKED PROPERLY! It was so bad, even had we wanted to, it couldn't be used. Later, I actually worked for a Vox outlet in B-Town (Short-lived, at least in the states, Vox equipment was JUNK, truly) and even Vox couldn't get it to work. That guy knew what he was doing! Either way, they got a new organ and he was almost $300 richer by screwing a bunch of kids. Oh, the tangled web we weave..
Any other weird stories about those times? Oh. Let me add this. I told you to ask me about the Batman TV series. Of course you remember the theme. Who doesn't. In the states, they released the theme as a 45 and it was actually played on the radio. When our manager found out, he went postal. He showed us this big spread in BILLBOARD magazine advertising the Theme from Batman by, guess who.. THE AVENGERS! I'm sure there was no band, it was a bunch of studio musicians. But there it was! Well, this little 'ol small-time manager composes a letter to (I think it was Capitol Records) and tells them that we have released records under that name, that we own it, and to cease and desist or we would OWN Capitol Records. What a hoot! CAPITOL RECORDS? They're GIANT! Not long, he showed us a new copy of Billboard. Still had an advertisement for the Theme from Batman.But this time it was by THE REVENGERS! Can you imagine? Gary Paxton's little label along with a garage band called the Avengers and a manager that made 10% a gig (probably $20-$30 a week) going up against Capitol Records AND THEY BACKED DOWN? Amazing. The could have told us to piss-off and what could we have done? Pretty cheeky, eh? Fun story though. Did The Avengers appear on any TV Shows? A couple of local shows. We certainly never were on Hullabaloo! Have you any Avengers pics or publicity items? I have one small newspaper picture with a little blurb underneath. It dates from 1966-67 so it's a bit old and discolored. I'll try scanning it and send it to you. I really don't have much else, sorry to say. I just didn't think about saving things for posterity. After all, we were to be America's answer to the Fab Four so what would a bunch of old clippings and pics do? 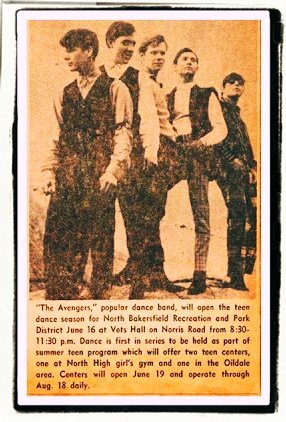 Here's the newspaper clipping of The Avengers Gerry saved 40 odd years ago. It's a shot of our heroes circa 1966/67 after Greg Likens and Jim Robesky had left the band. When and why did The Avengers break up? We began to implode around 1967. Personality clashes, women. Like most bands. None of us were drafted. Did you know any of your label mates such as Ken and the Fourth Dimension and Limey and the Yanks (Sunburst), Five Of Us and The Grodes (Current)? Yes. Actually, Kenny Johnson and his father, who had a demo studio in Bakersfield recorded a couple of demos for us and it was thru them that we met Gary Paxton. Ken and the Fourth Dimension, Limey and the Yanks and most of those groups were studio creations by Kenny. Not that they didn't become groups, but they were created in the minds and studio of the Johnson's. Kenny was a prolific writer. Although at the time I thought a lot of his stuff was teeny-bopper and mamby-pamby, I was quietly jealous of how well his songs fell together. At the time I was starting out, a big name local group was Kenny and the Ho-Dads. 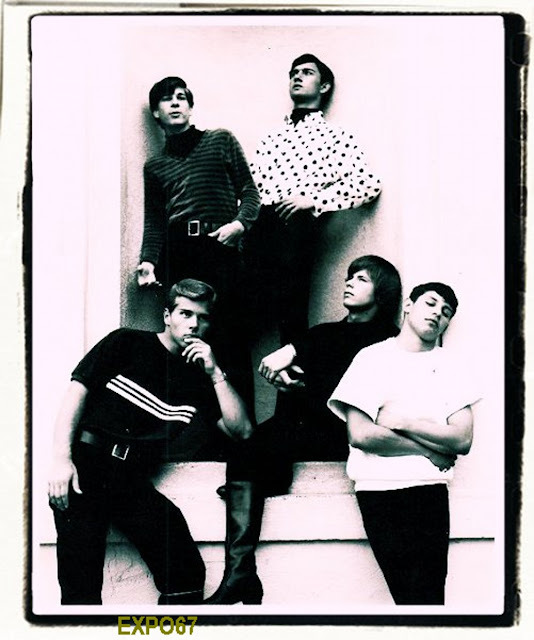 You mentioned that the Era and Sunburst labels were inter-twined during this cool garage era. Are you familiar with Era acts The Lyrics, The No-Na-Mees or Ty Wagner? There were a lot of people recording, doing demos for the Johnson's. They WERE Starburst. (and others). But our relationship was kind of short-lived. Once Gary Paxton was in the picture, the most we did with the Johnson's was go into the studio and make a demo of one of our songs for Gary. Something else you may be interested to know: I'm sure you heard of the Rev-Lons? Another Gary Paxton creation only this time it was the ladies turn. A friend of mine, Beverly Williams (exquisite singer) recorded several records for Gary Paxton on the Ace label and the Rev-Lons did back-up vocals for her. I was interested to learn from you that you know Kenny Johnson and Jerry Ritchie who were in obscure psych band The Chocolate Tunnel. Did The Chocolate Tunnel perform any gigs or were they just a studio creation with a one off 45? I think the Chocolate Tunnel did some gigs. But it was very fickle back then. Everybody was looking to "make it" and when it didn't happen fast, it was, "Ok, drop that.." and on to something else. After The Avengers you formed The United Sons Of America with ex Chocolate Tunnel bass player Jerry Ritchie. An LP was released on Mercury in 1970. Did The USA perform live? How did the album come about and were you pleased with the outcome? Yes, USA performed live many times. Eventually, as with some groups, disagreements and drugs played a large part in the demise of USA. GUESS WHO? - Gary Paxton. Paxton actually wasn't around much. But one day while we were rehearsing, I saw Gary and a couple of people, I figured buyers, in the control booth. We were breaking down our stuff and Gary came out and asked what the last song was we were playing. I told it it was ours. Next thing we knew, Bob Todd from Mercury Records came there and listened to us. Well, actually, some very young lady that was with him was listening. After our set. He just stood looking important and glanced down at his lady-friend and she looked up and slightly grinned and nodded her head yes. He looked at us and asked, "Would you guys like to sign with Mercury Records?" That's a true story. I suppose had she not liked us it would had turned out differently. The story gets even more twisted. Remind me to tell you about "..The rest of the story.."
The last Avengers 45 was released in 1967. Were you playing with any other bands after the demise of The Avengers until the start of The Sons Of America? There's a three year gap? Yes, I was in a couple of groups after The Avengers. Nothing of note. I got married and we had a little girl, Lisa, and I ended up getting a regular job. I was 20 yrs old. Then my brother came to me one day and said, Hey, I saw this group down at this club, they said they were looking for an organ player..That group, which introduced me to the club and lounge world, had a bass player named Jerry Ritchie.Imagine THAT! We played in this group for a few months, ended up in Las Vegas, group broke up, went back to B-Town and the United Sons of America was born. I enjoyed reading your interview with Jerry Blake of the Avengers. I grew up in Bakersfield, and like their music a lot. 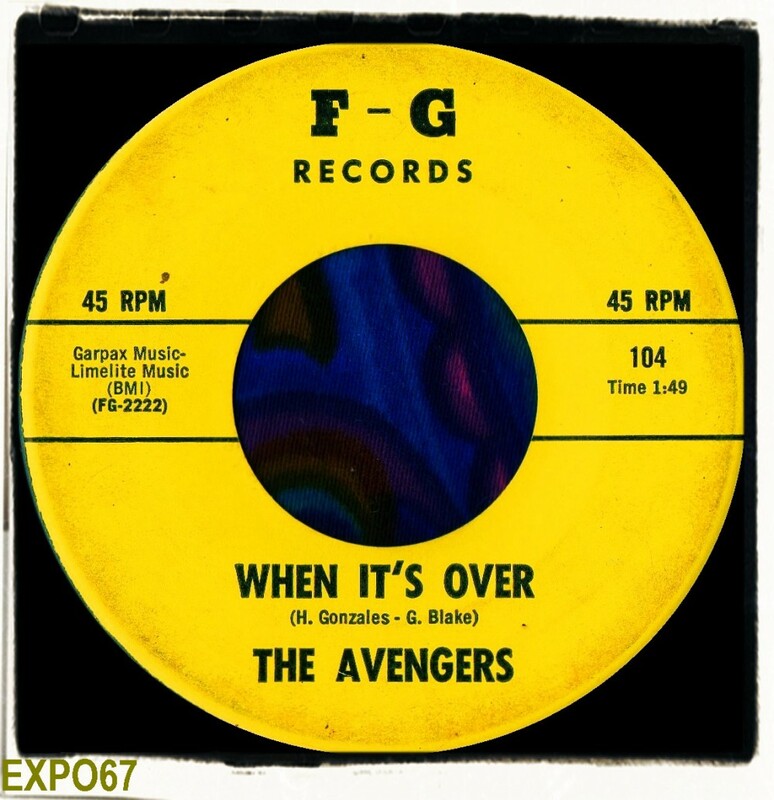 L.A. DJ Bob "Emperor" Hudson died in 1997, not during the era of the Avengers. This can be easily documented. Secondly, the reference to the Avengers being from San Bernardino, CA, was in an early online edition of Fuzz, Acid and Flowers. I wrote to them saying it was a mistake, but made a typo: I noted that they were from Bakersfield and managed by DJ Mike Lunky; there was no such person. I meant to type "Mike Lundy," and although I sent in a correction, that error was on their website (and I presume, in their book, too) for years. Kenny Johnson also wrote the flip side of Gary Lewis and the Playboys' hit "Green Grass." The Johnson song was called "I Can Read Between The Lines," and it could easily have succeeded as an A side. Great interview with The Avengers. I was also in a 60's group in a town about 60 miles south of Bakersfield (Lemoore). We played numerous gigs in the Bakersfield area and some with The Avengers. Our band was called "The Brymers and known for "Sacrifice." 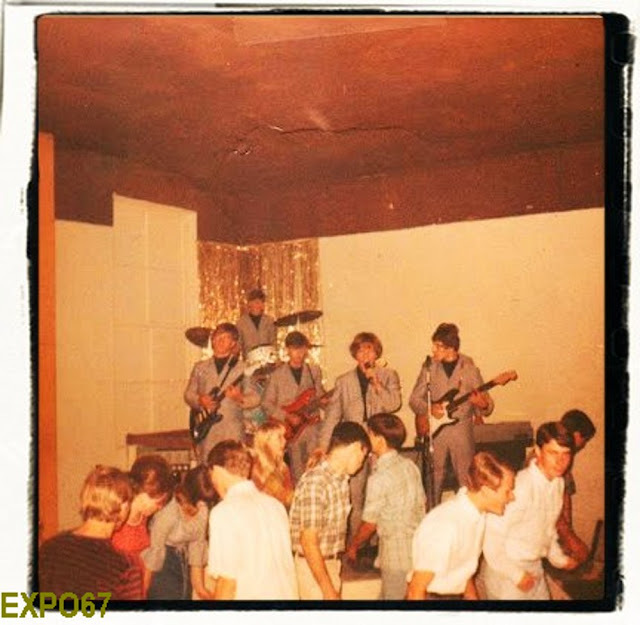 I have included a web page about 1960's San Joaquin Valley bands from the 60's on the Brymers web site. 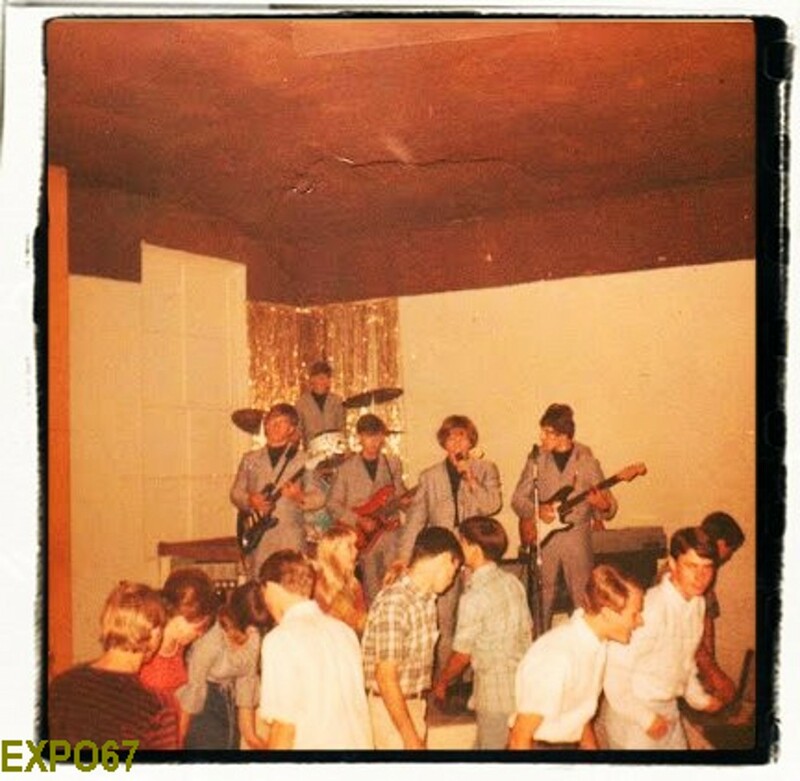 Check it out if you wish to know more about 1960’s central California garage bands. Visit: www.thebrymers.com and click on San Joaquin Valley Bands tab.